That was officially the first love letter I've written. And yes, I wrote my first LL to a jar of hot sauce. But you get it, right? You crush on her too, don't you? A few days ago I wandered around Gourmet Warehouse (i.e. : my fav store in Vancouver) like I do WAY too often. I don't know what made me miss the pretty little jar filled with spicy red chili paste on my previous 1.362 million other visits but this time it nearly jumped off the shelf and into my shopping basket all on its own. Be prepared for an onslaught of recipes featuring the famous harissa to be showing up around here soon. In case you and harissa haven't been acquainted before let me tell you a little about it. It's a north African spice mix made of chills, bell peppers, garlic, tomato and spices. It packs a punch of heat but is also super flavourful. It'll turn anything you make with it the most beautiful orangey red colour. You can use it on grilled meats, veggies, to flavour stocks, in dressings and (news flash!) soup. If it hides behind the ketchup bottle and you forget about it (which of course you'll never do) it will last for ages in your fridge. 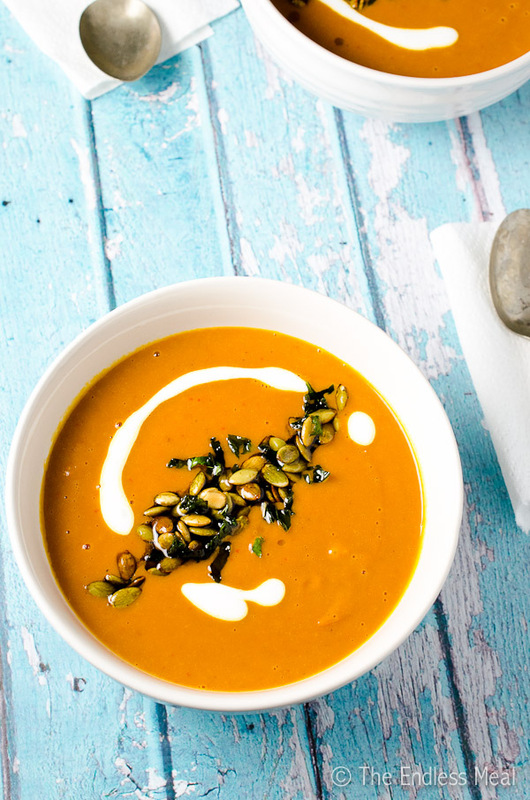 Let me tell you a bit about this harissa butternut squash soup. There's lots of layers of flavour going on between the silky butternut squash, the sweet carrots, the orange (which stands out just right) and the harissa. I love the crunchy pumpkin seeds on top but if you prefer an uninterrupted creamy soup you can always leave them off. I love the contrasting textures so I put them on even if I'm feeling lazy and don't want to crispy the mint. I have to stress that you should use the best stock you can. If you have 5 minutes to throw a few things in a pot and a few hours to let it gently simmer then that really is the best option. For a better idea about how to make your own homemade stock you can check out this post. It is for a chicken stock but the same method applied if you are making veggie stock or even beef stock. I have purposely not stated what kind of stock you should use. This is a very easy going soup and takes well to different types of stocks. Feel free to choose what you use based on what you have on hand, what you prefer to eat and how rich you want the soup to be. Beef broth will give you the richest soup, chicken somewhere in the middle and veggie the lightest. But … Don't be fooled into thinking a vegetarian broth will make the soup too light. It works very well and I almost think I might prefer it that way. 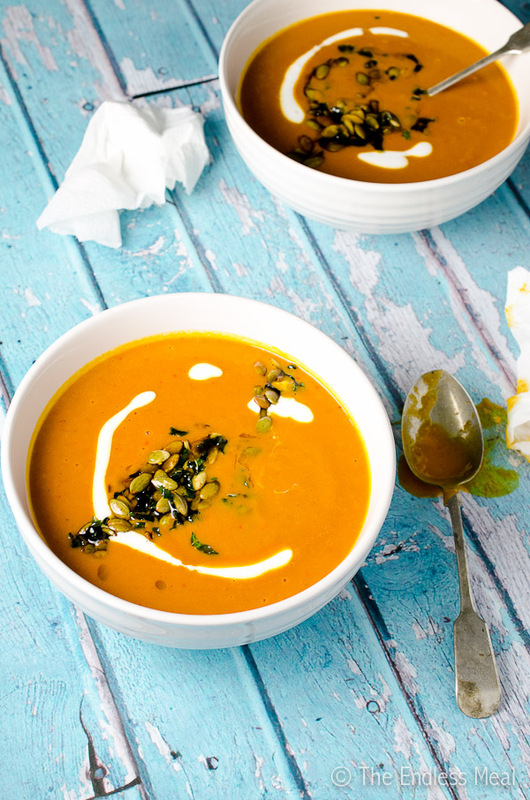 If you make Harissa Butternut Squash Soup with Pumpkin Seeds and Crispy Mint Leaves, make sure to snap a pic and tag @theendlessmeal on Instagram so I can like and comment on your photos. I love seeing TEM recipes you create. 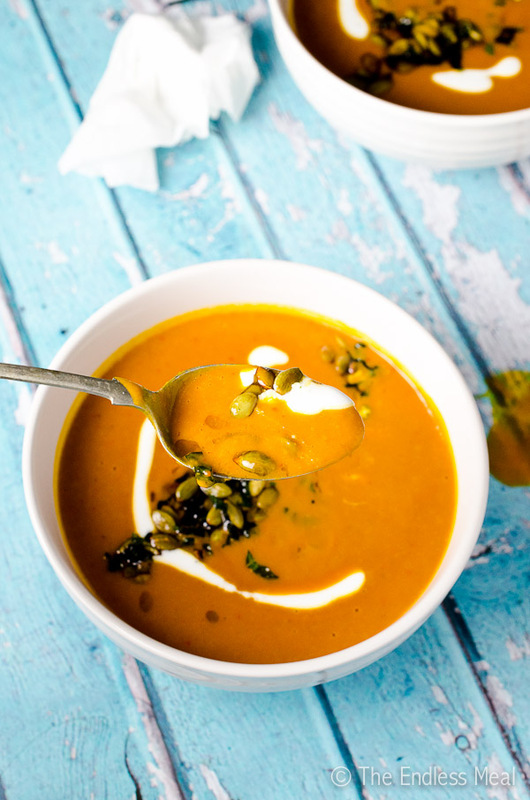 This delicious harissa butternut squash soup has a little zing from spicy harissa and is topped with toasted pumpkin seeds and mint leaves. It's so tasty! Preheat the oven to 425 degree. Line a baking sheet with parchment paper. Place the butternut squash and carrots on the prepared baking sheet and toss with the oil. Bake in the preheated oven for 40 minutes. While the squash and carrots are in the oven start the rest of the soup. Heat the remaining 2 tablespoons of oil in a large pot over medium high heat. Add the onion and cook for 5 minutes. Reduce the heat to medium and continue to cook for another 10 minutes, stirring occasionally, until the onion is very brown. Add the garlic and ginger and cook for 30 more seconds. Add the harissa, cumin and coriander and cook for 1 minute more, stirring constantly. Remove the pot from the heat and add the orange zest and juice. Leave the pot aside until the squash are carrots are ready. Heat the argan oil in a small frying pan over medium high heat. Add the toasted pumpkin seeds and cook for 1 minute, swirling the pan a few times. Add the chopped mint and cook for 30 more seconds. Remove from the heat and set the pan aside. When the squash and carrots are nicely browned take them out of the oven and put them in the pot with the rest of the ingredients. Add the stock and bring the pot to a boil. Reduce the heat and simmer for 10 minutes. Remove the soup from the heat and blend it in 2 batches, or use an immersion blender unit the soup is very smooth. Season to taste with sea salt and stir in the lemon juice. 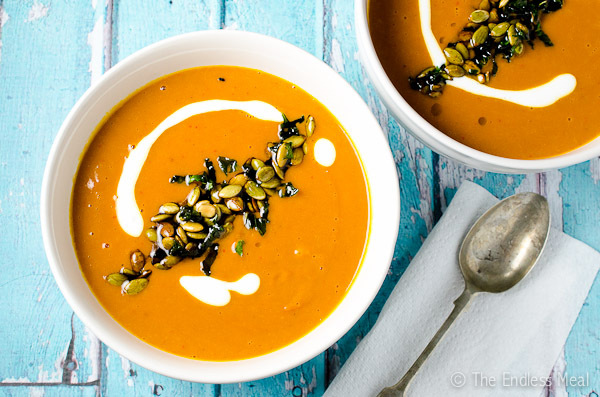 Serve the soup topped with the pumpkin seeds and crispy mint and the optional Greek yogurt. This turned out amazing! I used less broth to keep it thick and used a full lemon and lemon rind and omitted the orange all together since I forgot it on my grocery list. But it is by far one of the best soups I’ve ever made! So happy you shared it 😀 I think it is up there with my mushroom lemongrass coconut soup that I love to make. I’m so happy to hear you like the recipe! Hooray!! Genius, I love the idea of crispy mint leaves paired with smoky harrissa. Yum. I would love to include a link to the recipe in a fall inspiration round up I’m doing. Would that be ok with you Kristen? Absolutely it would be! Thank you so much for asking!! This looks absolutely gorgeous. I’ve been looking for butternut squash recipes and I’ll definitely have to give this one a go. I definitely have to try this tasty winter soup! Have a bottle of Harissa sitting in my fridge. Harissa’s the best, isn’t it?! Hope you love the soup as much as I do! Yes 🙂 but I didn’t know what to do with it except throw it in chick pea stews and couscous. Now I know! Thanks. 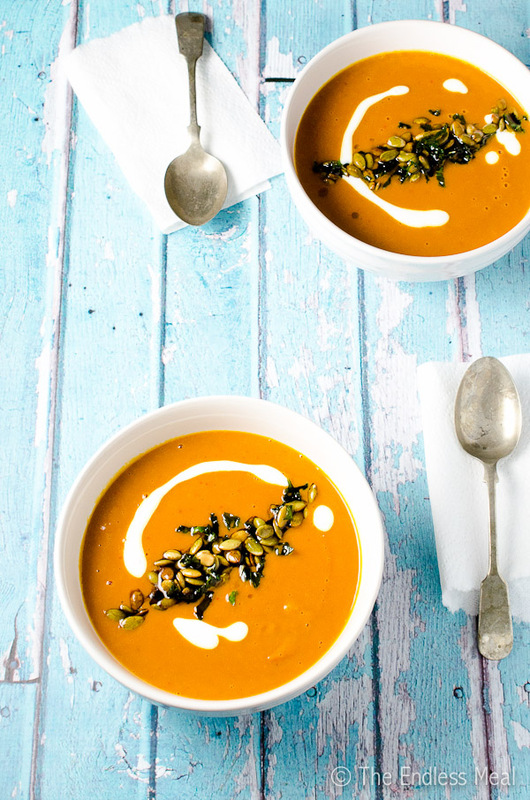 This is one incredible looking squash soup! I just love the vibrant colour of it.. and all those toasted pumpkin seeds over the top. I have to make the recipe!